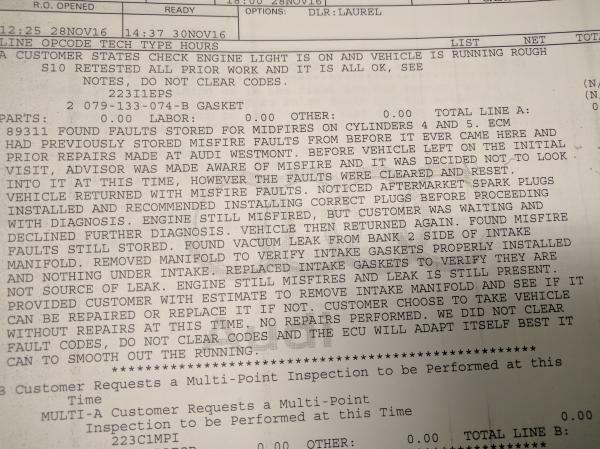 Recently went to the dealership (Audi Westmont, IL) with a coolant leak/crack and left with a horrible engine shudder at idle and a check engine light and a $2400 bill. I went back in and was told ALL plugs needed to be replaced. I ask "In a day? 'Cause I drove it here perfectly fine!" After running the total to over $2700... THE SHUDDER IS STILL THERE and the CEL is on ALL the time. Still searching for a way to fix my low-idle shudder. My code-reader from Amazon is in the mail and I will be posting codes. I posted a bunch of pics of my engine in my profile. Of which, I'm pretty certain the new coolant tank is connected using screws from Ace Hardware and they didn't secure all the hoses correctly. Let me know if there's anything else I can provide. Not sure why there isn't a code for the 7E9 but whatever. Looks like others have had the same situation. Cleared the codes this morning to see if/when/how they pop up again. Car actually drove pretty well but this afternoon on the highway going about 65 the CEL came back on. Car was still running better than before. The ignition coil for the #5 cylinder (front drivers side US) is failing. This will cause the shutter. Replace it (easy job and takes maybe 30 minutes) and clear the codes. If the lean code comes back, you could have a leaking flex joint in the exhaust on that same side of the engine (Bank 2). Your stealer....er....dealer sounds like they have some issues.. If the car is not under warranty, find a reputable German Car Shop in your area and dump the stealer.....er...dealer.. I don't call them that for nothing. Last edited by dave944; 12-01-2016 at 09:42 AM. Okay all, so after another 3 days at the dealership they basically told me they didn't know for sure but was just assuming the problem is from an air leak in the manifold. The car had self-corrected (I've had it for 3 years with no problems) and when they erased the codes the car lost it's self-correction history. They've basically washed their hands of me and wanted a pat on the back for identifying the air leak... which I haven't confirmed. Dave944, thank you for your input. Any other advise based on the following write-up would be appreciated. There is another source other than the intake gaskets that can cause lean error. The auxiliary air injection system. This is part of the emissions control system. There is an air pump usually located in the air filter box. This pump has a hose (about 15-19mm in diameter) that runs from it and out from under the airbox to steel lines located at the back of the engine. These lines are connected to the exhaust manifolds and get hot..... On my car (03 A8L), I kept getting the lean error codes also. I traced that hose from the airbox to the connection at the steel line and found that where the clamp holds the rubber line to the steel part, the hose had a small hole in it. It was also a bit gooey and soft for the last inch or so. I guess the heat had gotten to it. I snipped off about 3/4" (19mm) of the hose as I had just enough slack to reconnect it instead of replacing the entire line ($150 is bit much for rubber hose, no?) and cleared the codes. The lean codes went away. Around that time I had also had some shuttering on acceleration that turned out to be a couple of glazed spark plugs. dave944, wow you are really active on this site! So I was taking your advice this morning after researching where the secondary air pump is in the air filter box. Seemed straight forward. What I found was the accordion hose thing not connected to the air filter box with the top of the hose below the connection by about 1/2". I reconnected with some difficulty, cleared my P0305 this morning, and drove to work. It started out rough, but basically no codes the whole way and the power and response seemed to return. Will see if it starts up cold without a rough idle or shudder again. I'm sure the dealership will say 1. That hose was connected when they looked and 2. Even if it was connected it wouldn't have caused all the misfire/lean problems. I think that joint is just the intake air ducting. Even it was loose, it really shouldn't cause the misfire and lean issues since any air going through there has not gone through the MAF sensor and into the engine yet. I'd still check the hose from the auxiliary air pump to the hard lines at the rear of the engine. A lean condition can make the ECU try to adjust the fuel/air mix and end up fouling or glazing a couple of spark plugs. Even brand new ones. Just one glazed one is enough to make it shutter. Especially on a gradual application of the gas pedal. Last edited by dave944; 12-05-2016 at 12:59 PM. Dave early on in this thread you mention blown coils as a possible cause of issues, after reading that and having just replaced one on my wifes 04 last night. I was wondering how often you experience that issue. About 2 years ago "audry" as my wife calls her, got really nasty to me and I ended up replacing plugs and coils and major clean job on MAF. At that time I bought a new set of coils from buyautoparts.com and installed them. Since then I have had to replace 3(including last nights) of them, putting the original back in. Was thinking of buys another set, seems to have been a good investment to this point. I think I need to investigate your leaking air hose you stated above next. The coils will go bad. I had one on the #8 cylinder go bad a month of so ago. Started bucking on acceleration really bad but a quick look at the OBD codes pulled from the ECU revealed the issue quickly. I forget what the code number was but it was pretty specific about being the coil on #8. I replaced it, no issues since. You don't need to replace all of them at once. That's just crazy expensive. I ride them until they start tripping the OBD code for particular cylinders. If you don't have an OBD code reader, you need to get one. It'll save you a ton of trouble shooting time. It's really the first thing you should look at when having issues like this. 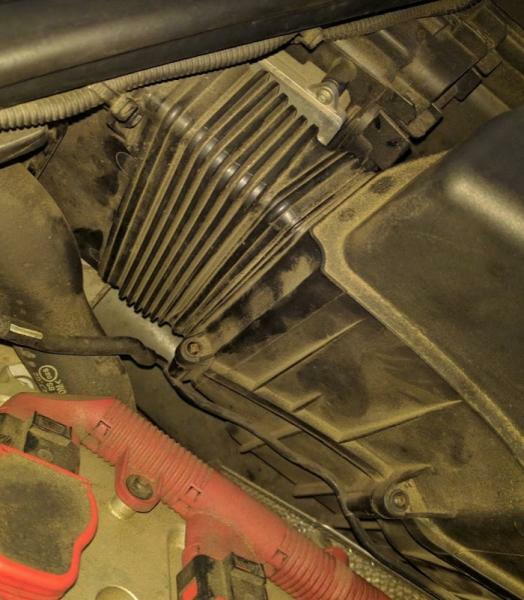 Here's a write up I did about my experience with those glazed spark plugs a couple or three years ago.. https://www.audiforums.com/forum/gen...k-plug-218806/ It might be a little helpful too. dave944 and anyone else: What coils do you suggest putting in the 4.2L? There are literally several different kinds, with some being more expensive than the OEM. Some reviews on Amazon say the "E" versions have resulted in better performance. I'm really just wanting to fix my car, but of course I think we all agree "better" is always better.